Dogs Vomiting - What Causes Dog Vomiting? 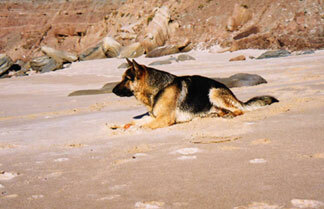 Dogs vomiting can be seen quite commonly and may happen because of many different reasons in your German Shepherd Dog. Please keep in mind that vomiting, in and of itself, is a symptom of many different diseases or problems. Oftentimes bouts of vomiting are self-limiting and will stop on their own after a few days or so. Even so, it can be quite serious and may even lead to death if you allow fluid or nutrient losses to become severe enough. How do I find the cause of my German Shepherds vomiting? Sometimes, especially when vomiting is associated with several of the above symptoms, a series of diagnostic tests will need to be done such as: blood tests and maybe even exploratory surgery. If your dog does not appear really sick from its bouts of vomiting, the actual problem causing the vomiting in the first place may be much less serious. Some things that may cause dog vomiting in the first place include viruses (stomach or intestinal), intestinal parasites, or things like eating garbage or many other kinds of irritating materials. If this is the cause for the vomiting then drugs can be given to control the intestinal tract and relieve the inflammation inside the intestinal tract. Additionally, a special diet of bland foods may be encouraged for a few days until the problem has stopped on its own. In this way the German Shepherds own healing powers will kick in to help correct the problem as well. Follow this process and you can usually expect improvement in your own German Shepherd within 2 to 4 days. If a positive change does not occur then a change in medication will need to be made and possibly even more tests will need to be performed as well. Dogs vomiting can be corrected, it just takes time. Keep an eye on your German Shepherds progress throughout this process and keep your veterinarian informed to help you manage the situation from start to finish and things should work themselves out quickly.